Everything about Spirit Camera: The Cursed Memoir sounds spooky, from the gameplay to the release date. Back in August, a lot of folks were thrilled to hear that celebrated horror series Fatal Frame was getting a spin-off. Not only that, but the successor title would allow them to hunt evil spirits with their 3DSes. At the time, details about the project were pretty scarce. Now, Nintendo has revealed a bunch of new information, including how gameplay mechanics work and the title's Friday the 13th release date. Spirit Camera: The Cursed Memoir is set to combine survival horror and augmented reality elements courtesy of the 3Ds's built-in camera. The game will be centered around a girl named Maya, who has been spotted lurking in the shadows of an old house. It's up to you to help her escape the building and its sinister "woman in black." In order to do this, you use the system's built in camera to watch the game's story unfold in your surroundings. Included with the game is a 16-page AR Book, known as the "diary of faces" in the game's Story Mode, which serves as a gateway into this haunting experience. As players view the book's images through the lenses of the Nintendo 3DS camera, they enter its pages using augmented reality. At times, pages will come to life in the form of movies, revealing past events that offer insights into the mysteries surrounding the diary. 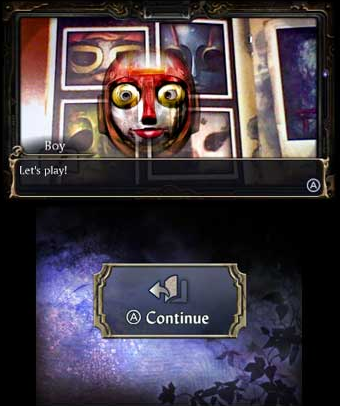 In other moments, characters will emerge from the pages into the player's world via augmented reality in the form of evil spirits that attack from all directions. Spirit Camera: The Cursed Memoir is due out for the 3DS on Friday, April 13th. The game isn't listed yet on either Amazon or GameStop, but that will probably change soon.